This project is a stand alone MP3 player, designed for home, car, or portable use. It plays a group of MP3 files stored on a standard or laptop IDE hard disk drive... hundreds of hours using even today's low-cost drives. The firmware is available under the GPL, for anyone who want to really customize the player. High quality audio output is provided by a 24 bit DAC, using both standard line-level outputs and an amplified headphone output. The large capacity allows the use of very high MP3 quality settings, that would reduce flash based players to only a few songs. Because it's a complete stand alone player usable in a variety of applications, you can have your entire MP3 music collection anywhere away from your computer. Update, February 2009: This mp3 player board is no longer available. A few displays and spare parts may be still purchased while stock remains. This project began long before Apple sold their first generation ipod and was available with boards in stock for nearly 9 years, but sadly we just can not continue it forever. These old web pages will remain online for reference and historical purposes. Fully Assembled and Tested Circuit Boards, which provide the "guts" of a player, all that is needed is to add a hard drive, memory SIMM, and a power source. 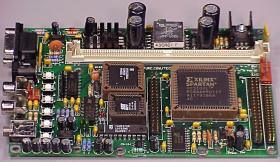 With an assembled board, the only electronics experience necessary is some familiarity with connecting PC computer parts, the IDE disk drive, a memory SIMM, and a power supply. Display, 24 Character by 8 Line LCD. This large screen connects to the MP3 player's 4-pin port. An adaptor board provides 12 pushbuttons which duplicate the functionality of the board's buttons and also provide additional features. Complete Kits and Partial Kits, which you can build instead of buying the board assembled. The kits require electronic assembly experience (soldering) with through-hole and low density surface mount electronic components. Short IDE Laptop Cables and 72 Pin SIMMs (used), which are often not available from normal computer supply vendors. Individual ICs. These are intended for engineers and hobbyists who wish to make substantial changes to the design or design their own player from the ground up. Backlight kits for the LCD are availale from Techknowman. There is a discussion group for this project at Yahoo Groups. This is a good place to post general questions and talk with other users. Thanks to Russ for setting this up. The old design is still on-line at this page. The old player was a very simple and limited design, based on the general purpose 8051 development board. We briefly sold ICs that were used in the older design, but a finished circuit board was never made... only point-to-point wiring. The old design will remain on-line, mostly for historical reference. PJRC High Capacity MP3 Player, Paul Stoffregen.